Above: A pair of Nkupi defending a swarm of fry. Twice I have found myself swimming along in midwater to find the water around me rippling as though I’m in a swarm of gnats. It then becomes clear I’m in a cloud of fry, thousands of them. The next thing I’ve noticed is the parents circling around me nervously. Boulengerochromis microlepis, also known as Nkupi or Yellow Belly, are the largest cichlid in the world, growing up to 70 cm in length. 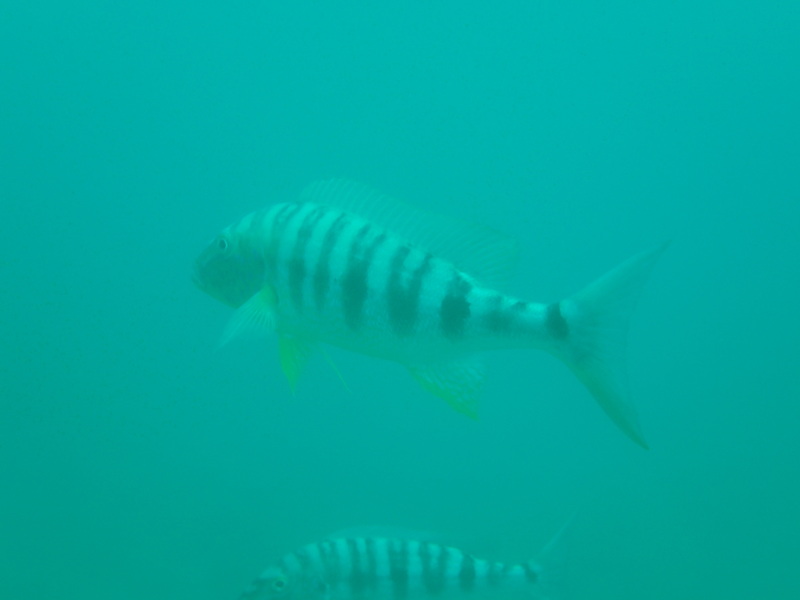 They are beautiful fish and very graceful in the water. They form at least socially monogamous pairs (to my knowledge nobody has actually done paternity work on them to look for cheating). These pairs fiercely defend the eggs, fry, and juveniles. It seems at least some of them have an issue with divers wearing yellow masks or snorkels. On a previous expedition, one diver got rammed by a Nkupi multiple times. Stop eating your fish friends!